Thomas Dunne Books, 9781250021465, 176pp. Despite the heat and humidity, people came in droves from across the country and around the world, heading for the towering spire of the Washington Monument in our nation's capital. All of the marchers—black, white, Christian, and Jew—shared the same dream: freedom and equality for 19 million African Americans. Almost 300,000 strong, the marchers poured into Washington, D.C., to bear witness, to hear the immortal words of Martin Luther King, Jr., and to petition Congress to pass the President's Civil Rights bill. Stanley Tretick, a seasoned photojournalist best known for his iconic images of President Kennedy and his family, was also in the crowd, drawing inspiration from the historic scenes unfolding before him. In this magnificent book, his stirring photographs of that day are published for the first time. 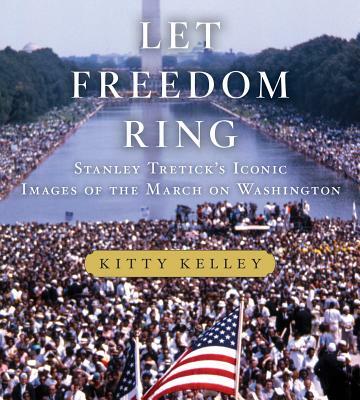 Accompanied by an insightful essay and captions from bestselling author Kitty Kelley, as well as a moving foreword by Marian Wright Edelman, Let Freedom Ring commemorates the fiftieth anniversary of the March on Washington and celebrates the crescendo of the Civil Rights movement in America.